Mobile, Alabama�s Thomas �Moose� Praytor rumbled to the top of the speed charts Sunday afternoon during testing for the ARCA Lucas Oil 200 presented by MAV TV at Daytona International Speedway. Praytor posted a time of 49.206 seconds clocking in at 182.905 miles per hour putting his Hixson/Max Force machine 3rd during Sunday afternoons test session. �Really an incredible afternoon. The 2 Cunningham cars lined up behind me and we we�re flying,� said Praytor. �We�ll be looking for them when they drop the green flag in February.� The trio recorded the top 3 spots for the day while drafting together on Sunday. 77 drivers from across the Unites States, Canada, Sweden, England and Australia took part in the 3 days of testing at the World Center of Speed with Praytor�s fastest lap on Sunday putting him 10th fastest of all drivers during the entire test. �This is really a gratifying weekend for us. We took a car built in Soddy Daisy, Tennessee, that we finished in Mobile, Alabama, to racing�s biggest stage and out ran some of the biggest names in all of racing.� While the results were impressive the process was painful. Chassis #4, nicknamed �Tigger�, as in bouncy, trouncy, had never been to the track before this weekend. In fact, Tigger is the first complete in house Superspeedway car designed and developed by Hixson Motorsports and the gremlins that come with a prototype car were in full force at Daytona. �We thrashed for 2 days before we made our first lap late Saturday afternoon. Every time we found an issue we fixed it and another would crop up. It tested everyone on our race team.� With time ticking away Tigger�s second time on the track was in the draft. Praytor�s speed on Saturday put him right behind 8 time Daytona Champion Bobby Gerhardt and just in front of Hendrick Development driver Chase Elliott. No rest for the weary. Praytor is in route back to Mobile for a fund raiser for the American Diabetes Association on Monday night. The Moose will be the celebrity bartender at the Fairhope Brewing Company from 6-8 with the proceeds going to the American Diabetes Association. Picture: Tigger in primer grey making laps at Daytona. Teams typically test a new car in primer so they can make changes to the body before applying the paint and sticker scheme for race day. Praytor is one of three drivers with ties to Mobile International Speedway testing in Daytona this weekend. ARCA Mobile 200 winner Grant Enfinger will be testing with Team BCR and Darin Mathews will be testing with the legendary James Hylton this weekend. The Daytona test is the final event on the ARCA calendar and will close out what has been an improbable and incredible season for Praytor and his Hixson/Max Force Racing effort. Picture: Tigger in the Max Force Racing Shop in Mobile before heading to Daytona International Speedway. Mobile, Alabama�s Thomas �Moose� Praytor received the 2013 H.G. Adcox Sportsman of the Year Award at the ARCA annual awards banquet in Indianapolis, Indiana. The H.G. Adcox Sportsman of the Year Award is presented every year to honor an individual or group that exhibits the ability to show class in competition and truly defines sportsmanship to fellow competitors, officials, and fans in the ARCA Racing Series. Driving for Hixson Motorsports and his family�s Max Force Racing, Praytor is coming off his first full season of ARCA competition finishing 9th in the ARCA Championship standings. �This award normally goes to someone who has been doing this a long time, not a rookie. There are some really big names in racing that have won this award, it�s just incredible that I�m now one of them. " The awards namesake Grant Adcox drove to success in the ARCA Racing Series winning the Sportsman Award in 1988 before losing his life in a NASCAR accident at Atlanta Motor Speedway in 1989. While winning the ARCA Sportsman Award 25 years apart, Praytor and Adcox share some other racing similarities. Both carry the number 2 in ARCA Series competition and both campaign out of shops within miles of each other in Tennessee. Adcox worked out of his family owned operation in Chattanooga, Tennessee and today just up the road Praytor works out of Hixson Motorsports in Soddy-Daisy, Tennessee. 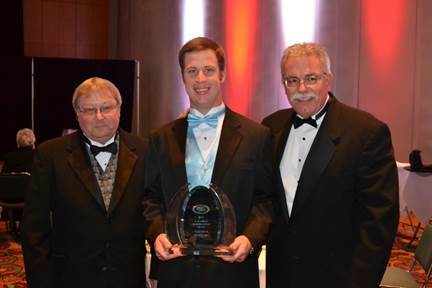 Picture (L-R) ARCA Technical Services Director Bobby Thomsen, Praytor and ARCA President Ron Drager. Praytor will spend Thursday, Friday and Saturday in North Carolina picking up parts and pieces that will be put to use in Daytona and beyond. Then back to the Coast to take in the Derby, �We might not be racing but I�m not going to miss it.� A few short days in Mobile to prep the Daytona car and then back on the road to the ARCA Banquet and trade show in Indianapolis, December 11th-15th. The weekend after the banquet the Moose will be headed for ARCA testing in Daytona from 18th-22nd. Scott�s Rookie of the Year Candidate Thomas �Moose� Praytor and his Mobile based Max Force Racing team only expected to run 3 races in 2013, enter Soddy Daisy, Tennessee�s Wayne Hixson and his Hixson Motorsports operation and the combined effort competed in all 21 ARCA events. The Tennessee/Alabama effort with an all volunteer pit crew not only finished 9th in the ARCA Championship standings they became a media and fan favorite. On a shoe string budget the Max Force/Hixson Motorsports team garnered media numbers that not only put them in the top 10 in the standings but in the top 10 for all ARCA regulars for TV time for their primary sponsors! Across every media platform, social, print, digital and broadcast Praytor and his Max Force/Hixson Motorsports effort out performed and over delivered in medium. The Moose was trending #2 on al.com while in Daytona. Pictures Top (L-R) Being interviewed by AL.com/Mobile Press Register Mark Inabinett, Fox/Speed broadcast from Daytona, At the podium during press conference. Bottom (L-R) In the Mobile, Alabama shop with WKRG TV 5 (CBS) Randy Patrick, In Fox 10 Studio with Joe Emer, Fox/Speed Broadcast from Pocono, prerace interview at Talladega Superspeedway. 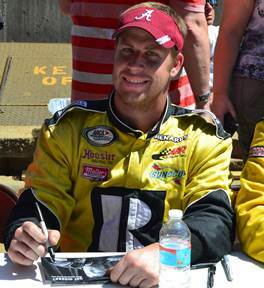 Thomas "Moose" Praytor of Mobile had three ARCA Racing Series events on his driving schedule when the 2013 season started. He ended up racing in 21. "I had a great time," Praytor said. "It was a lot of fun. We're very fortunate to get to do what we did. We did all the races, and we were only supposed to do three. I can't think everybody enough that helped us out -- Wayne Hixson (of Hixson Motorsports), Howard Bixman with Team BCR and, of course, my family. I couldn't do it without my family. "It was just a great year for us, and I hope we get to do it again next year." So after a full season of ARCA racing, how did Praytor spend that first free Saturday night in October? "The first weekend the season was over, I think I was in the race shop," Praytor said. "It never ends, but for some reason we love it." Praytor's season on the ARCA circuit was a joint venture between Hixson Motorsports and his family team, Max Force Racing. 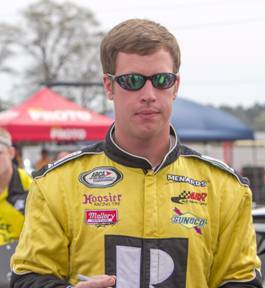 Praytor had participated in four ARCA races before tackling the full schedule in 2013 - a departure from his initial plans to race at Daytona International Speedway, his hometrack of Mobile International Speedway and Talladega Superspeedway. Praytor doesn't want the knowledge he accumulated on his way to finishing ninth in the season standings to go to waste. "Pretty much every racetrack we went to, I'd never been to before in my life. During the race, that was my learning experience. Now that I'm past that, I don't have that 'I've never been to a dirt track before' any more. Hopefully, we can take everything we learned and apply it to next year and, hopefully, do a lot better and contend a little bit more. Maybe I won't be so timid with the racecars this time, because I didn't want to tear them up." One of the most difficult things about his ARCA season - his unfamiliarity with the series' tracks - had its bright side, Praytor said. "The best thing to me was going around to all the different places - Wisconsin, New Jersey, Kansas - all these places I've never been to before and probably never would go to if we weren't racing here," he said. "Just going to the different racetracks and being able to go out for practice and be like, 'You know what? The Cup Series was just out here, and now you're up next.' It's really cool to be able to do that." Praytor could pick out several other personal highlights from the season, but the season was a highlight itself. "I did the whole season. That's what I'm proud about," he said. "We finished ninth in championship points, and we did the whole season. That was a big deal for us - a very, very big deal. I can't thank Wayne Hixson out of Soddy Daisy, Tenn., enough. He really believes in me, and he really believes in our race team. I think we're going to go big places next year, just do a little bit better in the ARCA Series." At the top of the moments-he'll-never-forget list from the 2013 season, Praytor has his first ARCA top-10 finish in the Akona 250 at Elko Speedway in Elko, Minn., on June 1. "The first top 10 I had, that was a big moment for me and my dad (Tommy Praytor)," he said. "Getting out of the car, and I was like, 'You know what, Dad? I just finished in the top 10.' That was the coolest thing to me, to be able to look at him eye to eye. We hugged it out and everything on pit road. It was a very cool thing because we go everywhere together, and every top 10 or every time we had a good finish when he wasn't too furious about the race, everything was good. Just to be able to go to the racetrack with my family and have some time with them. My mom came every now and then. My sister came. It was just great to spend the time with them at the racetrack." While Praytor didn't have much experience on the ARCA tracks, he also didn't have much experience with the travel involved in chasing the racing dream. "I'd probably never been away from Mobile for more than a week," he said, "and there was a time there that I was gone for two months straight. Not being here, not being able to see my friends, it was tough for a little bit. But I was getting to do the deal. I was getting to do what most guys dream of doing, I've always dreamed of doing since I was a little kid. Once I got past that, everything was great." After SWAT team members demonstrated a unique hostage rescue, the Moose got an opportunity to show off his skills with everything from a 9mm pistol to a sub machine gun. �I had a great time, I don�t think I hit anything but I had a great time (see video). Sheriff Cochran and his team are always working to stay one step ahead of the bad guys. Spend a little time with them and you get an idea of how hard their job is.� Always on the cutting edge of protecting and serving the community, Sheriff Cochran�s �Yellow Dot Program� and �Bully Blocker� are two of the Departments latest initiatives. 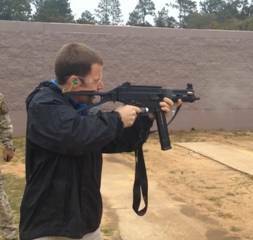 Picture: Praytor with machine gun (click on pic for video). 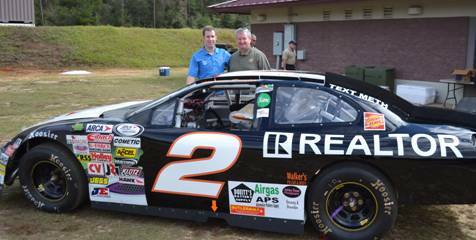 Praytor and Sheriff Sam Cochran with Realtor Ford Fusion. The ARCA Racing Series presented by Menards will return to Mobile Int'l Speedway in Mobile, Alabama on March 22, 2014. Defending ARCA Mobile 200 champion and Fairhope, Alabama native Grant Enfinger led a star-packed media event Wednesday in Mobile. 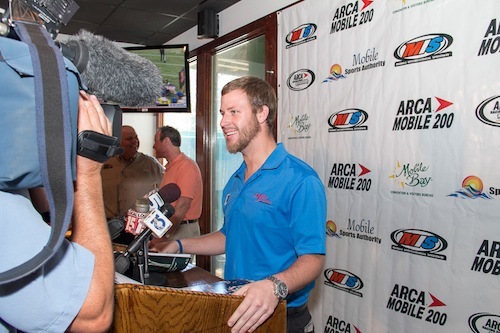 "It is my honor as a Mobile International Speedway driver and the defending ARCA Mobile 200 champion to announce that the ARCA Series is coming back to Mobile in 2014," Enfinger said. ARCA Week will begin on Saturday, March 15 with an open practice for ARCA teams and culminate with the third running of the ARCA Mobile 200 on Saturday, March 22. "The combined efforts of everyone associated with the ARCA Mobile 200 have clearly created a winning formula for the ARCA Racing Series presented by Menards," said ARCA President Ron Drager. "For the third consecutive year, we will bring the series directly from the season opener at Daytona in February to Mobile in March for the second race of the season. The ARCA Mobile 200 is now talked about all season long by the entire ARCA community-race teams, fans, media and officials. We're pleased and proud our series has found a home on the Gulf Coast." Local Mobile, Alabama driver Thomas "Moose" Praytor, who finished ninth in 2013 ARCA championship standings, said, "Mobile International Speedway has been a launching point for each level of my racing career, my first stock car start, my first ARCA start and this year our effort at Mobile led to 19 more races with Hixson Motorsports in the Realtor car. After all the new tracks this year I'm really happy ARCA is coming back to my home track." Local Mobile drivers Enfinger and Cale Gale have provided story book endings to the first two ARCA Mobile 200s, winning in front of the home town fans. 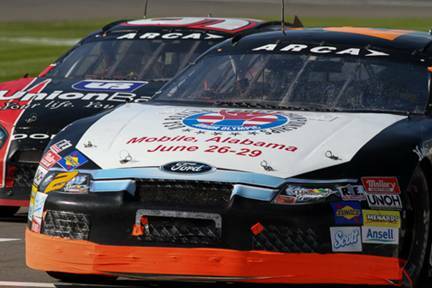 While the ARCA series has raced at over 200 different tracks since its inception in 1953, the 2014 ARCA Mobile 200 marks only the third appearance at Mobile International Speedway. 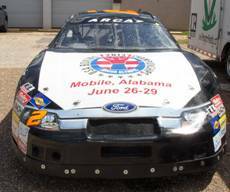 "The community has embraced the ARCA Series and the ARCA Mobile 200 has become much more than a race; it's a happening," said ARCA Mobile 200 Promoter, Tommy Praytor. "The Mobile Sports Authority, Mobile Convention & Visitors Bureau and Alabama's Tourism Department all realize the importance of this race to Mobile and it takes everyone to make it happen." Opened in 1964, Mobile International Speedway is Alabama's fastest half mile and is currently host to the Sunoco Southern Super Series and Miller Lite Super Late Model Series along with a regular schedule of Saturday night racing. Lee and Ida Fields purchased the Speedway in 1972 and for almost 40 years the duo produced "The Fastest Fun Around". The track is currently being managed and promoted by Tim Bryant who is also the owner/promoter of Pensacola's 5 Flags Speedway, the home of the Snowball Derby. Mobile International Speedway is part of a long tradition of Alabama tracks ARCA has competed on. The ARCA Racing Series history in Alabama reaches back to 1961 when, on November 5, Ernie Derr won a 250-lap race at Birmingham. ARCA race events at the Fairgrounds in Montgomery in 1962, at Huntsville Speedway in 1963 and 1965, followed by a long tenure at Talladega Superspeedway (1969-present), have kept ARCA's presence in Alabama alive over the decades. The ARCA Racing Series presented by Menards has crowned an ARCA national champion each year since its inaugural season in 1953, and has toured over 200 race tracks in 26 states since its inception. The series has tested the abilities of drivers and race teams over the most diverse schedule of stock car racing events in the world, visiting tracks ranging from 0.375 mile to 2.66 miles in length, on both paved and dirt surfaces as well as a left- and right-turn road course in its most recent season. Founded by John and Mildred Marcum in 1953 in Toledo, Ohio, the Automobile Racing Club of America (ARCA) is recognized among the leading sanctioning bodies in the country. In its seventh decade of competition having completed hundreds of thousands of miles of racing, ARCA administers over 100 race events each season in three professional touring series and local weekly events. The month of August had 3 consecutive races broadcast by NBC Sports Network. Thomas �Moose� Praytor and the Realtor car carried in car cameras at Berlin and Springfield. Along with a couple of short tracks Praytor made his first career start on dirt at the Illinois State Fair Grounds. On a shoe string budget and an all volunteer crew the Hixson Motorsports/Max Force Racing effort continue to put the Realtor brand in the top 10 of all sponsors on the tour. Pictures Top (L-R) Signing autographs in Berlin, Michigan. Realtor car under the Ferris wheel at the Illinois State Fair Ground, Realtor/G Force machine on track at Berlin. Bottom (L-R) Realtor car racing with Ross Kenseth at Madison International Speedway, On the dirt at Springfield, Hixson Motorsport/Max Force team making a pit stop in the dirt at the Illinois State Fair Ground. After spending the year behind the wheel of the Realtor Car, Thomas "Moose" Praytor will be stepping out for Diabetes on Saturday. "My Grandmother taught us all it is important to give back whenever we can. The Diabetes Walk is just a small way for me to help on something that hits real close to home," said Praytor. "My cousin and roommate, Lee Wingard, is a Diabetic and I know what he has to deal with everyday. I would appreciate our fans clicking on the link below and even if its only $5 help us fight this terrible disease." Both shops are already tearing down cars and getting them ready to go again. The Mobile crew is cleaning and prepping �Batman� for a special appearance next week. The �Moose�, Thomas Praytor, will be back at Mobile International Speedway this Saturday night to sign autographs during intermission and take in the last night of racing at his home track. Praytor has just returned from Kansas Speedway where a top 20 solidified his 9th place finish in the ARCA Championship standings. �You would think after the schedule we�ve had, the last place you would see me is the racetrack but I can�t wait to get back to Mobile International Speedway. I�ve really missed my Mobile racing family and there is nothing like a short track Saturday night under the lights,� said Praytor. Saturday night will be the final night of racing at Mobile International Speedway and after 6 rain outs the forecast is perfect. The Island Motors II Bombers, Bobs Speed Shop Sportsman and Alabama Pipe and Supply Modifieds will all be in action crowning the 2013 Season Champions. As a special bonus to the fans, Saturday night�s grandstand ticket is only $5.00 with the races starting at 7:00. Picture: Praytor with Soddy-Daisy Hillbilly beard at Kansas Speedway. All of the 2013 points have been counted and recounted by ARCA officials with the final bonus points being awarded on Tuesday, after 21 races, 2399 laps, 42,522 travel miles and thousands of hours of work by an all volunteer crew, Thomas �Moose� Praytor and his Hixson Motorsports/Max Force Racing Team are 9th in the Championship standings. While the next event on the ARCA calendar is not until the Championship banquet on December 14th the Hixson Motorsports/Max Force Racing effort is already back at work in both the Mobile and Soddy-Daisy race shops. 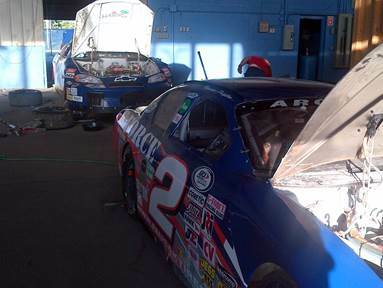 (L) Team owner Wayne Hixson and the Moose at Daytona (R) All volunteer crew pitting Realtor Ford at Kentucky. (L) Praytor signing autographs with 79 year old James Hylton in his final season (R) Realtor/G Force Chevy on the dirt in Springfield. (L) Realtor Chevy working through the s turns at New Jersey Motorsports Park (R) Realtor Chevy and the Moose recording first top 10 at Elko Speedway in Minnesota. (L) Olympic Boxing Hood with Mobile�s Former US Light weight Champion, Jack Tillman (M) AIDB auction with Darrel Waltrip (R) Charity helmet with AJ McCarron. Going in to the final race of the 2013 ARCA season each team has an agenda, for some it�s to run up front and win the race at all cost, for others making their first start it�s simply to have a good day preparing for 2014 and there is everything in between. For Hixson Motorsports/Max Force Racing with their Scott�s Rookie of the Year Candidate Thomas �Moose� Praytor�s goal was simple, do or don�t do whatever it takes to remain in the top 10 in the Championship standings. The Kansas Lottery 98.9 presented by the Rock started with a full day of technical inspection at Kansas Speedway. The lengthy tech process caused the team to make an afternoons worth of changes before Praytor headed to Cabela�s for an autograph session. �This was my first trip to Kansas Speedway and the place is like the Taj Mahal of racing, it�s incredible. My Dad was the color commentator for the first TV broadcast and even he was blown away by all the development around the track,� offered Praytor. Qualifying in the ARCA Series is usually an uneventful happening with the only drama being who will set the fast time and take home the Ansell Pole Award. Friday�s qualifying took on a new meaning as 5 of the first 10 out either spun or wrecked during their qualifying effort. A conservative setup just got more conservative as the tire pressures were changed to handle the cooler track with less grip. �After seeing some really great drivers struggle we changed our setup up some and I changed my first lap to make sure our Realtor Fusion had all 4 corners on when we got done. I was glad we did because on cold tires our car was a handful. My 2nd lap was better but still off from practice.� Praytor would roll off 25th. While the day had been beautiful the weather was changing and anyone with a phone or an Ipad could see the change rolling across the country side. The race strategy became much like the strategy used all season by the underfunded team with shops in Soddy-Daisy, Tennessee and Mobile, Alabama, don�t take yourself out early, out point the competition and go the distance. The team devised a plan that would put the Realtor Fusion on pit road early and often continuing to keep the tank full of Sunoco to gamble on the long green flag run to the end or when the weather hit. With years of watching hurricanes on the coast the team estimated that the race would go the distance or get really close to it, and like a road course the idea was to be the first person to be able to go the distance. As the race neared the halfway point the gamblers started making their final bets, to come in or gamble and stay out. The Hixson Motorsports/Max Force Racing effort had already put its chips on the table. In order for the gamble to payoff the rain had to stay away and the race had to go the distance. Little did they know. At lap 60 it was announced the race would go 5 more laps and stop due to the weather coming towards the track, not at the track but coming. �Between my Dad and Wayne (Hixson) I think they have more than 50 years of racing experience and they said it was the first time they could ever remember a race being called while it was going on and before it started raining.� The early ending doomed the 2 to a 19th place finish. The rain would come 30 minutes after the drop of the early green flag and when it came it came big. After tabulating all the bonus points and rechecking the numbers ARCA will post it�s final Championship points standings on Tuesday or Wednesday. Pictures: (Top) Thomas �Moose� Praytor racing with 79 year old James Hylton. Kansas was the final race of a storied career for the 1966 NASCAR Sprint Cup Rookie of the Year. Hylton�s paint scheme was a throw back scheme to his first Daytona 500 start. Picture courtesy of the Kansas City Star. 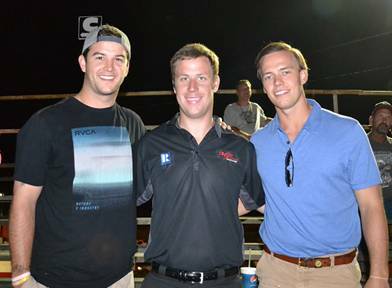 Middle: Praytor and the Realtor Ford racing with Josh Williams (02) and now 10 time ARCA Champion Frank Kimmel (44). Courtesy of ARCA Racing. 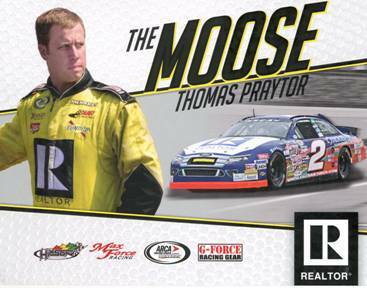 MOOSE SIGHTING-Thomas �Moose� Praytor will make be signing autographs at the Cabela�s next to the Kansas Speedway on Thursday from 5-6PM. The Kansas Lottery 98.9 the Rock is a 2 day event with a full day of technical inspection on Thursday. Practice, qualifying and the race are all on Friday, October 4th. Practice is from 9:00-11:15 AM, Menards Pole Qualifying presented by Ansell is at 5:35 with the green flag at 7:30 PM. Live timing and scoring for practice, qualifying and the race will be on ARCAracing.com with live television coverage from Fox Sports 1. CAR: Roush Fenway Chassis RK275, nickname �Batman�. The Dark Knight has been used at Michigan, Pocono, Chicago and most recently in the Zloop 150 in Kentucky. Batman is the teams preferred Speedway Chassis and recorded a top 10 in Michigan before a crash at Chicago took it out of commission, the last race at Kentucky was Batman�s first race back in action. Batman is a former Sprint Cup winning chassis used by Greg Biffle. HIXSON MOTORSPORTS/MAX FORCE RACING: Max Force Racing is based out of Mobile, Alabama and is fielding cars in its 16th season of competition. Max Force has teamed with another home grown operation, Hixson Motorsports with 4 decades of experience in the ARCA Series from Soddy Daisy Tennessee for the 2013 season. 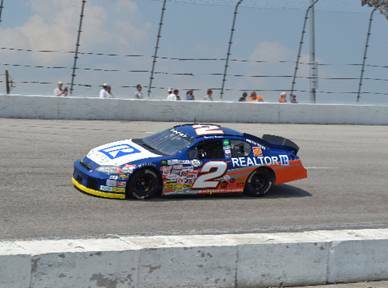 THOMAS �MOOSE� PRAYTOR: In 2012, Moose made his first ARCA start in the inaugural ARCA-Mobile 200 at Mobile International Speedway. He also raced in the International Motorsports Hall of Fame 250 at Talladega with Andy Belmont Racing and rounded out the season with a couple of starts for Venturini Motorsports. Praytor is currently 8th in the ARCA Series Championship point�s standings. Prior to the ARCA series, The Moose started cutting his racing teeth at 8 years old on short tracks across the Southeast, racking up local and state titles along the way. The Moose and his Max Force Racing Team earned the Ironman Status of the Gulf Coast in 2011 for competing in every Late Model (Pro & Super) Race at Mobile International Speedway and Five Flags Speedway, finishing in the top 10 in the Championship standings at both tracks. Away from the track Praytor was one of AJ McCarron�s centers through grade school and high school winning a state title in 2007. Recently the duo teamed up donating a specially prepared McCarron replica racing helmet that Praytor wore at Daytona and Talladega to the Alabama Institute of Deaf & Blind for their annual Race Fever auction. For more on the Moose- www.realtorcar.com. Picture: �Batman� racing with Chase Elliott at Kentucky Speedway during Zloop 150. 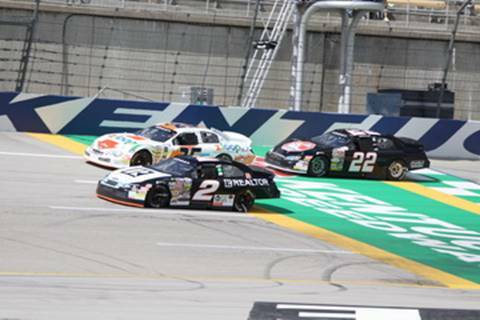 The Zloop 150 at Kentucky Speedway was the realization of a 12 year olds racing dream for Thomas �Moose� Praytor. As part of the Outdoor Channel film crew, Kentucky was the site of Praytor�s first ARCA race and the beginning of a dream of competing in the most versatile driving series in the world. The last of a 10 consecutive race week stretch, the Zloop 150 marked the return of �Batman� the Hixson Motorsports/Max Force Racing preferred down force chassis that was lost in the first of the 10 race stretch at Chicago. Performance Vehicle Works in North Carolina spent the last few weeks working overtime to not just repair but replace the Realtor car from the rear of the roof to the back bumper. With such an extensive repair the team did not get the car back until after Salem and the thrashing was on with just 3 days to prepare for Kentucky. The Mobile crew spent Wednesday pulling out the motor and transmission while the Soddy Daisy crew prepped the new motor and the backup car, just in case. Late Wednesday early Thursday morning the Mobile crew arrived in Soddy Daisy with Batman. On Thursday the backup motor that wasn�t 100% complete was finished and installed in the car. The team then went to work on finishing the setup and prepping the car for the Zloop 150. At 11:00 on Thursday night the trailer door was closed in Soddy Daisy and the team arrived in Kentucky at 5:30 AM on Friday morning. A couple of hours of sleep and the garage was open for a busy 1 day show. Mobile�s Grant Enfigner was parked one garage over with his Team BCR group fresh off their win from Iowa. Howard Bixman Team BCR owner, or as we call him 1800CREWCHIEF stepped in to help the Scotts Rookie of the Year Candidate. Rain washed out qualifying and the race on Friday and the Realtor car would roll of 11th based on 2013 owner�s points on Saturday allowing the team to get some much needed rest. The Realtor car dodged some serious bullets with wrecks that happened just in front of or beside Praytor. With 30 laps to go the Realtor Ford got really loose going in to turn 3, the right rear had been punctured by debris. Praytor brought the car to pit road under green and while the tire was replaced the team lost valuable laps and would finish 19th. 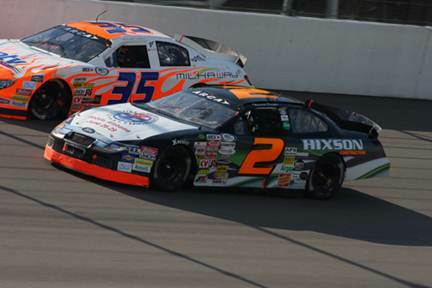 Originally scheduled for just 3 races in 2013 the joint effort of Hixson Motorsport and Max Force Racing has spent most of the season in the top 10 in the Championship standings, currently 8th with just 1 race remaining. Picture: Realtor car racing with Justin Boston in the Zloop Toyota and Will Kimmel. The Zloop 150 is a 1 day event with practice, qualifying and the race all on Friday, September 20th. Practice is from 1:00-3:00 PM, Menards Pole Qualifying presented by Ansell at 5:15 with the green flag at 8:00 PM. Live timing and scoring for practice, qualifying and the race will be on ARCAracing.com with live television coverage from Fox Sports 1. CAR: Roush Fenway Chassis RK275, nickname �Batman�. The Dark Knight has been used at Michigan, Pocono and Chicago, recording a top 10 in Michigan and has been out of service since being wrecked in Chicago. Batman is a former Sprint Cup winning chassis used by Greg Biffle. Picture: �Batman� with sponsorship from US Olympic Boxing Championships on track at Michigan International Speedway earlier this year. The ARCA Series rolled into Salem Speedway making its 94th stop at the storied half-mile for the Kentuckiana Ford Dealer Fall Classic presented by Federated Car. For Scott�s Rookie of the Year Candidate Thomas �Moose� Praytor making his 3rd start at Salem, would also make Salem his most visited ARCA track. Off the trailer, the Realtor car was solid, pacing inside the top 20 in the first practice session. A round of changes and another set of tires found the team struggling, �We went from good to just horrible and thought something was wrong with the car. After a couple more rounds of changes we realized we had a bad set of tires, changed them out for another set and �Mickie� came back to life.� The Realtor car would qualify 19th. With the drop of the green flag the Realtor car was holding its own amongst a stout field of cars while maintaining a spot in the top 20. With the first caution a good day would start to go bad. �Our Realtor car brakes had been good under green but when the caution came out the pedal just went to the floor. The guys checked out the normal brake problems under caution but it felt like something broke under the dash.� A post race inspection found the brake bias bar was broken keeping the brakes from getting any real or consistent pressure. Going in to the corner one lap and there would be no brakes, the next time the left front would lock up smoking the tire.� Salem with a good car is a long day, Salem with no brakes is just brutal. Ranked 8th in the ARCA Championship standings with just 3 races remaining, an early exit on lap 20 could have dropped Praytor out of the top 10. And with the press of a brake pedal the mission changed from racing to surviving. 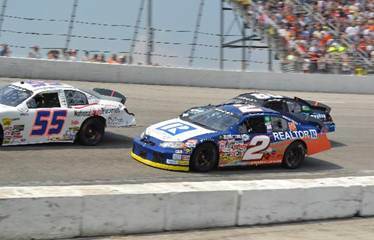 The toughest part of the balancing act for the ARCA rookie was to race the car hard enough to maintain the minimum speed while not locking up the left front. If Praytor had not been able to keep up the required minimum speed he would be forced to park. After alternating from locking up the left front or no brakes for a 175 laps the left front tire couldn�t stand anymore and it blew out with 3 laps to go. And the Moose brought his ailing Realtor Chevy to pit road one final time. Keeping the Realtor car rolling until the end would garner Praytor a 17th place finish instead of 30th earning precious Championship points that not only kept the team in the top 10 but able to hold on to the 8th position. 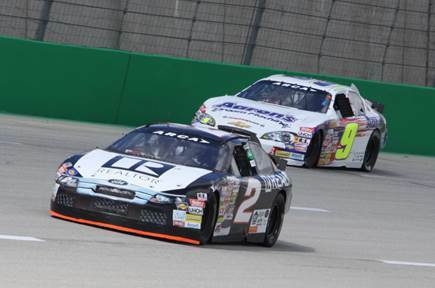 With just 2 races in the 2013 season the Hixson Motorsports/Max Force Racing team has a short week prepping for the Zloop 150 at Kentucky Speedway on Friday night under the lights, live on SPEED. 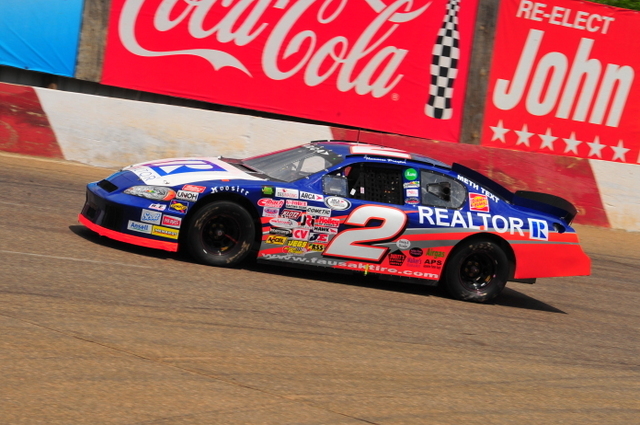 Picture: Realtor Chevy rim riding during the Kentuckiana Ford Dealers 200 presented by Federated Car Care at Salem Speedway. The Kenutckiana Ford Dealers Fall Classic presented by Federated Car Care is a 1 day event with practice, qualifying and the race all on Saturday, September 14th. Practice is from 12:30-1:15 and 1:45-2:30, Menards Pole Qualifying presented by Ansell at 4:00 with the green flag 7:15 PM. Live timing and scoring along with the race radio broadcast will be on ARCAracing.com. CAR: Hixson Motorsports chassis #3, nickname �Mickie Mouse�. Mickie is the chassis the team utilized for the spring race in Salem, both dirt races-Springfield & DuQuoin, Mobile International Speedway and Berlin Raceway. Picture: Mickie on track during the Spring race at Salem. A field as stout as the thousands of acres of corn fields surrounding the Iowa Speedway traveled to America�s Heartland for the Prairie Meadows 150. 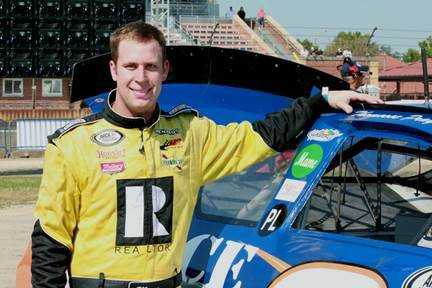 With more than half the field made up of non ARCA regulars Thomas �Moose� Praytor found himself in the tall cotton. While there were many agendas amongst the diverse field, for Praytor and the Realtor car, currently in the top 10 in the championships standings, the job at hand was much more defined. The Realtor car picked up over a second in qualifying from it�s final practice time and would roll off 25th. Repairing a broken window net brace after qualifying would send the Realtor machine to the end of the field and would be a preview of the night ahead. With the drop of the green flag the Moose was on the move and quickly got back the spots lost because of the penalty for the window net repair. While Praytor was picking up spots early under the lights the Realtor car was wicked loose. �The sun went down and the grip we had gotten back in practice was gone and our Realtor car just wasn�t just free it was wicked loose.� The Prairie Meadows 150 took on a green flag look and there was a long green flag run before Praytor could get back to pit road and the attention of his Hixson Motorsports/Max Force Racing team. �The guys threw everything at it and we got better but not where we needed to be. We moved up the racetrack and found some grip up there but not enough.� Praytor and the Realtor car would hold on for a 21st place finish. Mobile International Speedway had solid representation on Saturday night in Iowa, with 3 hometown drivers in the field, Enfinger, Praytor and Darren Mathews whose night ended early with a broken oil line. Next up Kentuckiana Ford Dealers ARCA Fall Classic presented by Federated Car Care at Salem Speedway. 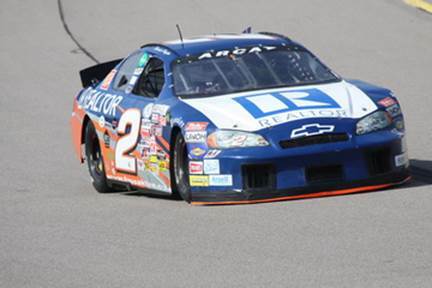 Picture: Realtor car driving off turn 4 at Iowa Speedway. September 7th. Practice is from 1:30-3:00, Menards Pole Qualifying at 5:00 with the green flag 8:00 PM. Live timing and scoring on ARCAracing.com. Saturday�s race will be the first on Fox Sports with Fox Sports 2 carrying the live broadcast with replays on Fox Sports 1. Fox Sports 2 can be found on Direct TV at channel 618 and on Dish at channel 398. Fox Sports 1 is on Direct TV channel 219 and Dish channel 150. Check with your local cable provider for channels in your market. CAR: Hixson Motorsports chassis #5, nickname �Pooh� as in �Winnie the Pooh�. �Pooh� is the team�s preferred short track car but has become the team�s workhouse this season filling in for the team�s speedway car �Batman� lost in Chicago and has doubled as a road course car. Two of the team�s top 10s this season have come with �Pooh� at Elko and Winchester. Picture: New Realtor �Moose� hero card complete with the story of how the Moose got his nickname on the back. 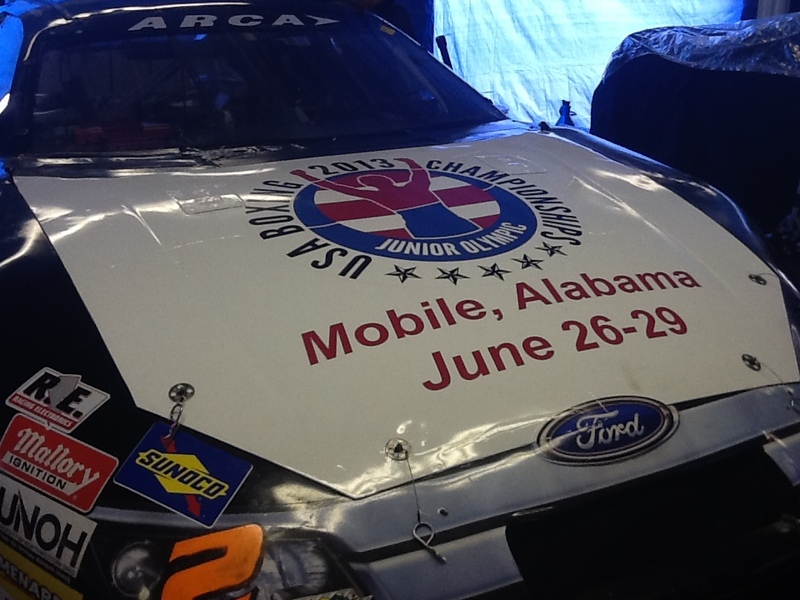 Pictures, layout and graphics by Ashley Rowe the Official Photographer of the ARCA Mobile 200. NBC Sports Network aired the first of 4 ARCA Series presented by Menards broadcast with the Herr�s Chase the Taste 200 from Winchester Speedway and the Realtor car was part of the historic broadcast with an in car camera while Thomas �Moose� Praytor etched an ARCA best finish of 9th. SPEED followed with their coverage of the ModSpace 125 of ARCA�s second visit to Pocono in 2013. 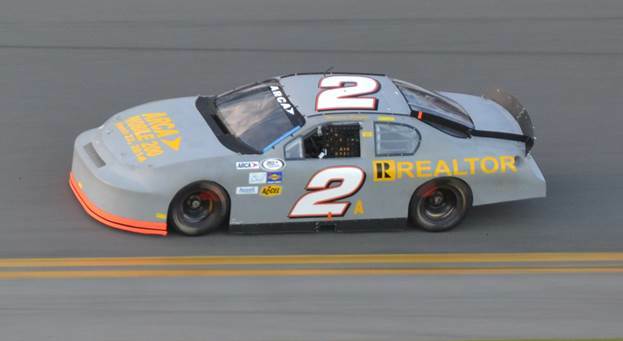 The Hixson Motrosports/Max Force Racing Realtor entry continues to produce solid numbers in Praytor�s Rookie season. 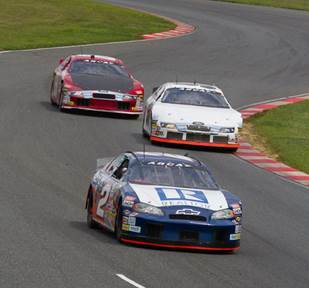 Pictures Top (L-R) Realtor car on track at Pocono. Splash and go during all green flag lap ModSpace 125. Realtor car on track at Wiinchester. Bottom (L-R) In car shot from NBC Sports Network in car camera. Moose installing a little hardware to Realtor car compliments of Venturini Motorsports, Moose on 3 wide charge at Pocono. 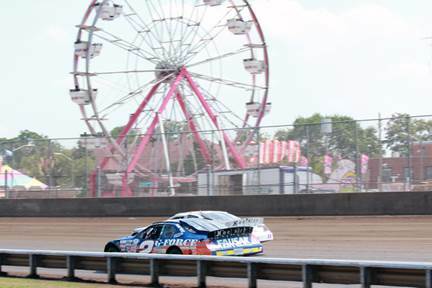 After a crash course on dirt racing in Springfield a couple of weeks ago Thomas �Moose� Praytor was looking forward to the return to dirt racing this weekend at the Illinois in the Southern Illinois 100 presented by Federated Car Care at the DuQuoin State Fare. After a few get to know you laps at the Magic Mile the ARCA Scotts Rookie of the Year Candidate was showing some dirt skills that put Praytor inside the top 20 on the speed chart during the one and only practice session of the day. �Mr. Wayne (Hixson) put the whip to me on the radio today and his coaching really paid off as our Realtor Chevy got faster after every run. The ever changing track conditions of the dirt was tough for me to keep up with. We�d get the car where I liked it and 10 minutes later the track would dry out some and I never got in a position where I was comfortable,� offered Praytor. Qualifying did not go as planned for the Realtor car as the track turned to the tight (car will not turn) side and the Moose had a lot of ARCA cars in front of him. With such poor track position the team utilized the parade laps to adjust and change a tire on the Realtor machine before the drop of the green flag to help free (make the car turn better) the car up. No rest in the shop this week as the team has a short week before heading to Iowa for the Prairie Meadows 150 at Iowa Speedway on Saturday September 7th with live coverage from Fox Sports. Picture top: Realtor Car kicked sideway in turn 4 at DuQuoin State Fairground. Picture bottom: Praytor sporting Alabama Crimson tide visor supporting old teammate AJ McCarron during autograph session in DuQuoin. Note: Having spent the last couple of weeks in Soddy-Daisy Tennessee the Moose has embraced his inner Hillbilly with a fresh growth on his face. Could this be the beginning of a new Moose Dynasty? 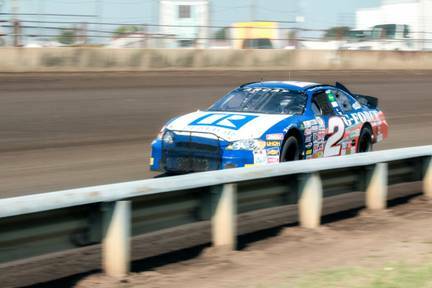 The Southern Illinois 100 presented by Federated Car Care at the DuQuoin State Fairgrounds is a 1 day event with practice, qualifying and the race all on Labor Day, Monday, September 2nd. The green flag flies at 1:30 pm with live radio broadcast, timing and scoring on ARCAracing.com. CAR: Hixson Motorsports chassis #3, nickname �Mickie Mouse�. Mickie is the chassis the team utilized at the first dirt race in Springfield. Mickie was also used at Mobile International Speedway, Berlin Raceway and Salem Speedway. Pictures compliments of Ashley Rowe, Official Photographer of the ARCA-Mobile 200. Top Picture: Realtor car on the dirt at the Illinois State Fairgrounds in Springfield. Notice the extra screen guard on the front of the car, it keeps dirt out of the radiator and helps the car stay cool for 100 laps. Bottom Picture: A really cool shot of the ageless veteran James Hylton and Thomas �Moose� Praytor working the crowd before the last dirt race at Springfield. The 79 year old Hylton is in his final season of competition and Praytor in his first full season. Hylton was the 1966 Sprint Cup Rookie of the Year and was the Sprint Cup Championship Runner Up to David Pearson (1966) and twice to the King, Richard Petty (1967 & 1971). 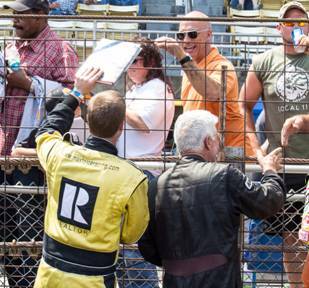 Sundays running of the Herr�s Live Life With Flavor 200 has been circled on the Hixson Motorsports/Max Force Racing calendar since the beginning of the ARCA Series presented by Menards season. Scotts Rookie of the contender Thomas �Moose� Praytor had actually turned laps at the track before and the layout is similar to Mobile International Speedway, Praytor�s home track. At the end of the first practice �Pooh� developed a transmission leak that would cost the team the second practice repairing. �We got lucky on the transmission in practice but it cost us the fine tuning we needed in the second practice for qualifying.� Praytor would time in 17th just one spot off last year�s qualifying effort with Venturini Motorsport. While the Hixson Motorsports/Max Force team was fighting an ill motor Venturini Motorsport�s Kyle Benjamin was setting a torrid pace and the race went 130 green flag laps to the end. Praytor and the Realtor car would settle for a 14th place finish. Next up the Southern Illinois 100 presented by Federated Car Care at the DuQuoin State Fairgrounds on Monday, Labor Day September 2nd. Picture: Realtor car working on getting by Venturini�s Milka Duno and Eddie Sharp Racings William Gallaher. 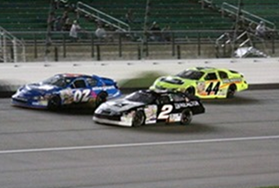 The Herr�s Live Life With Flavor 200 at Madison International Speedway is a 2 day event with practice and qualifying on Saturday followed by the green flag on Sunday, August 25th at 2:00PM. ARCAracing.com will feature live timing and scoring of all on-track activity as well as live flag-to-flag audio coverage of the race. NBC Sports Network will broadcast the race on a tape delay on Thursday August 29th at 10:00PM CST. SPRINGFIELD BROADCAST ON NBC SPORTS NETWORK FRIDAY NIGHT AT 10:00 PM CST-See the finish that everyone is taking about! CAR: Hixson Motorsports chassis #5, nickname �Pooh�. �Pooh� is the team�s preferred short track car but has become the team�s workhouse this season filling in for the team�s speedway car �Batman� lost in Chicago and doubling as a road course car. Two of the team�s top 10s this season have come with �Pooh� at Elko and Winchester. Picture: Last week�s winner, Brennan �Bull� Poole racing with Thomas �Moose� Praytor at Winchester Speedway. The carnival atmosphere surrounding the Illinois State Fair was the perfect backdrop for Thomas �Moose� Praytor to make his first dirt start in almost 14 years. By returning to the 1 mile dirt oval for the 51st Allen Crowe Memorial 100 the ARCA Series presented by Menards continues to prove itself as the most versatile driving series in the world with its first of 2 races on dirt, that follow road courses, superspeedways, Speedways and a healthy dose of short tracks. Even with the flat it looked the Realtor car was headed to a solid finish until Praytor started reporting the right front was going flat again. �Our Realtor car just wouldn�t turn anymore again and I thought we had another flat.� Under the next caution Praytor brought the Realtor Chevy back to the attention of his Hixson/Max Force team and 2 more tires. Back under green tires didn�t help and the Realtor car had to come to pit road under green flag conditions. �We hated coming in under green but we were in trouble.� This stop the team got under the hood and quickly found out the issue was the heim joint that holds the sway bar on had been ground down with first flat and was now completely broken. �We went from having a good day to just hanging on and finished the last third of the race without any sway bar. Our Realtor Chevy was so good we were still passing cars even without the bar. 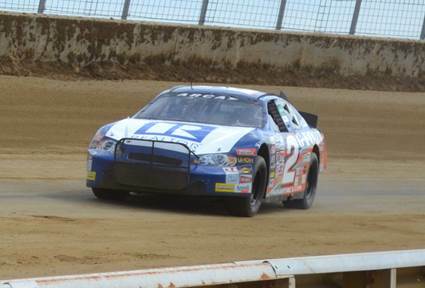 We�ll get another shot at the dirt in DuQuoin in a couple of weeks.� Praytor and the Realtor car finished 22nd. Pictures Courtesy of Ashley Rowe, Official Photographer of the ARCA Mobile 200. Middle: Realtor car racing with Josh Williams down the front straight. Bottom: Special �PL� sticker for Alabama Real Estate Commission Executive Officer Philip Lasater. 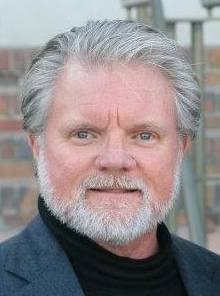 The Alabama Realtor family enters the weekend with a heavy heart after the unexpected passing of Philip Lasater, Executive Director of the Alabama Real Estate Commission on Thursday. To honor Lasater�s more that 25 years of service to the Real Estate community, the Realtor car piloted by 3rd generation Realtor, Thomas �Moose� Praytor will run a special �PL� sticker for Lasater during the Allen Crowe Memorial 100 at the Illinois State Fairground. The Allen Crowe Memorial 100 at the Illinois State Fairground is a one day event on Sunday, August 18th, with practice from 9:00-10:00 AM, Menards Pole Qualifying at 11:15 with the green flag at 1:30 PM EST. ARCAracing.com will feature live timing and scoring of all on-track activity as well as live flag-to-flag audio coverage of the race. NBC Sports Network will broadcast the race on a tape delay on Friday August 23rd at 10:00PM CST. BERLIN BROADCAST ON NBC SPORTS NETWORK TONIGHT AT 10:00 PM CST-Praytor part of in car coverage. CAR: Hixson Motorsports chassis #3, nickname �Mickie Mouse�. Mickie is the chassis the team utilized last week at Berlin Raceway to an 18th place finish. 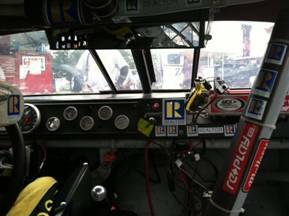 Mickie was also used at Mobile International Speedway and Salem Speedway earlier this year. Picture: Thomas �Moose� Praytor with his last dirt ride. In car view from inside Realtor Chevy. After road courses, speedways and the Tricky Triangle in Pocono Thomas �Moose� Praytor was looking forward to having his Realtor Chevy back on a short track like Berlin Raceway in Marne, Michigan. The last 2 short track outings for the SCOTTS Rookie of the Year candidate had produced 2 top 10s and a career best 9th at Winchester Speedway in Indiana. While the Primera Plastics 200 was expected to produce the same type of results it just didn�t go the team�s way this weekend and the Realtor Chevy finished 18th. 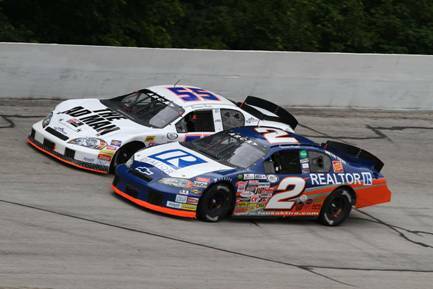 Picture: Thomas �Moose Praytor and Realtor car on the front stretch at Berlin Raceway during the Primera Plastics 200. 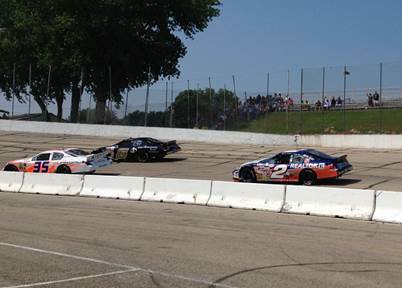 The Primera Plastics 200 at Berlin Raceway is a one day event on Saturday, August 10th, with practice from 2:00-2:45 and 3:15-3:45, Menards Pole Qualifying at 5:00 with the green flag at 8:30 PM EST. ARCAracing.com will feature live timing and scoring of all on-track activity as well as live flag-to-flag audio coverage of the race. NBC Sports Network will broadcast the race on a tape delay on Thursday August 15th at 10:00PM CST. CAR: Hixson Motorsports chassis #3, nickname �Mickie Mouse�. Mickie Mouse is the chassis the team utilized at Mobile International Speedway and Salem Speedway earlier this year. This will be the first race for Mickie since the front end was wrecked at the Kenutckiana Ford Dealers 200 presented by Crosley Radio at Salem. 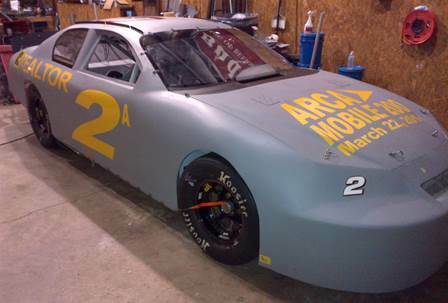 Picture: Chassis #3 Mickey Mouse at the ARCA Mobile 200 in March. GREEN! GREEN! GREEN! Is normally heard several times during an ARCA series race to signal the field to start racing or to go back racing after a caution. During Fridays ModSpace 125 it was heard only once as the huge field of ARCA cars took the green flag to start the race and then made the 125 miles around the Tricky Triangle without a caution. 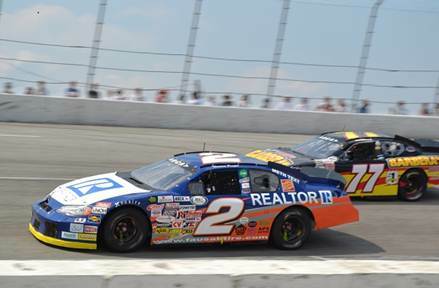 For Thomas "Moose" Praytor and his Realtor car team a 24th place finish in an all green flag race was a fitting ending to a long racing trip begun a week before at New Jersey Motorsports Park. Mobile, Alabama and Soddy Daisy,Tennessee are not known as the center of the racing world and when 10 straight weeks line up on the schedule with 2 back to back races about as far away from the Heart of Dixie you can get in New Jersey and Pennsylvania it requires some creativity on how to make that work. For the combined Hixson Motorsports/ Max Force racing effort, staying in New Jersey workings on cars made the most of the time between races and with a helping hand from fellow competitor and Cherry Hill, New Jersey native Tom Hessert a place to make it happen. The Hesserts loaned the team some space in one of their old car dealerships and the days in between the Barbera Autoland 150 at New Jersey Motorsports Park and the ModSpace 125 at Pocono Speedway were spent preparing the road course car, "Pooh" for Pocono and chassis #3 "Mickey Mouse" for Berlin. For a small team like the combined effort of Hixson Motorsports and Max Force Racing having 2 Realtor cars completely ready for action is a luxury normally only available to the larger teams. As usual at Pocono weather became part of the story with rain washing out practice and qualifying on Thursday. An early practice was planned for Friday morning that was fogged out causing qualifying to be cancelled and a short practice session took its place. With the loss of the teams Speedway chassis, "Batman" in Chicago the team went to it's short track work horse, "Pooh" for the final Superspeedway race of the season. "We had Batman flying in Chicago and we were really looking forward to taking it back to Pocono, one of the few places I've been to before, but the guys couldn't get it ready to go again in time. Taking a short track car to a Superspeedway race is like taking a knife to a gun fight but we still learned some valuable lessons that will help when Batman comes back on line,� offered Praytor. Practice speeds put Praytor and the Realtor car 23rd out of the 37 cars at the Speedway. Middle Top-Pair of Realtor cars in one of the Hesserts old car dealership in New Jersey. Middle Bottom-A view from the ARCA pace car going over the tunnel turn on Thursday. Bottom-At at a track about as far away as you can get from Mobile, Alabama we enjoyed having some family and friends. Left-Thomas�s cousin Lily Seestedt took a turn behind the wheel of the Realtor Chevy after the ModSpace 125. Right-longtime engine builder and the dean of Motorsports Broadcasting on the Gulf Coast, Tom Claxton spent the week with the team in Philadelphia and Pocono. The launch of NBC ARCA racing coverage starts tonight at 10:00 PM CST on the NBC sports Network with the Herr Chase the Taste 200 from Winchester Speedway in Indiana. Tonight marks the first of 4 ARCA broadcast in 2013 and a huge investment in stock car racing with NBC signing on for the second half of the NASCAR season beginning in 2014. Viewers will get a front row seat from multiple in car cameras including Thomas �Moose� Praytor�s Realtor Chevy. �Looking forward to tonight�s broadcast. It�s an honor to be a part of the start of NBCs relationship with ARCA,� said Praytor. Praytor and his Hixson Motorsports/Max Force team recorded his career best finish of 9th in Winchester scoring his third top 10 of the 2013 season. �There was a lot of close racing in Winchester and I know we had some close calls with our Realtor Chevy, our in car should be fun to watch.� NBC Sports Network can be seen in Mobile on Comcast 53 and ATT Uverse 640. While the Winchester broadcast is tonight the ModSpace 125 from Pocono is happening now. What was slated as a practice day was washed out with a modified schedule for tomorrow, practice at 7:00 AM CST, qualifying 12:15 CST and the ModSpace 125 live on Speed at 4:15 CST. Picture: Realtor in car shot from Herr�s Chase the Taste 200 at Winchester. CAR: Hixson Motorsports chassis #5, nickname �Pooh� as in Winnie the Pooh. Pooh is the team�s short track work horse with a 10th place finish at Elko and Praytor�s career best finish of 9th at Winchester Speedway. The Moose drove Pooh at the road courses to a 16th place finish at Road America & 17th at New Jersey Motorsports Park. Practice for the ModSpace 125 is Thursday, August 1st from 2-4 PM CST. Menards Pole Qualifying presented by Ansell is Friday with the green flag for the ModSpace 125 set for 4:15 with live coverage from SPEED. ARCAracing.com will feature live timing and scoring of all on-track activity as well as live flag-to-flag audio coverage of the race. The ARCA Series is part of a triple header weekend at Pocono with the NASCAR Camping World Truck Series and the NASCAR Sprint Cup Series. 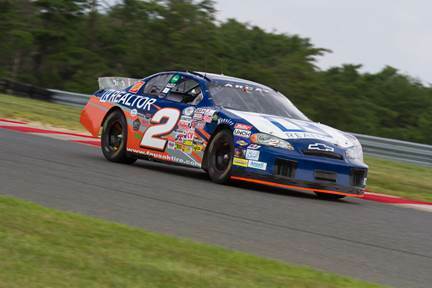 Picture: Realtor car negotiating the S turns at New Jersey Motorsports Park. To say the road courses on the ARCA series schedule are a new experience for Scott Rookie of the Year Candidate Thomas "Moose" Praytor would be an understatement. Praytor and his Realtor car came into the Barbera Autoland 150 8th in points, 120 points out of 7th, looking to hold serve on the other title contenders. The Hixson Motorsports/Max Force Race team not only held serve but closed in on 6th and 7th and notched a top 20 finish. "We knew going in we had a long weekend ahead of us but our Realtor team was determined to improve our road course program. The road course put a lot of pressure on our converted short track Realtor car and our guys worked hard on keeping Pooh going,� offered Praytor. A faulty brake piston in the left front was caught after qualifying and the team thrashed on rebuilding the caliber on Sunday morning before the race. Under green the Realtor Chevy kept up but was no match for the top 10. 25 laps in Praytor lost 2nd gear, which is critical at New Jersey and was forced to nurse the Realtor car through the final half of the Barbera Autoland 150 to a 17th place finish. The 120 point deficit to 7th has been reduced to 50 and Praytor closed 25 points on 6th. The team is staying in Philadelphia this week converting back the road course car for action this weekend at Pocono and preparing the Berlin car. Next up is the ModSpace 125 at Pocono Raceway on Friday afternoon at 4:15 CST with live coverage on SPEED. Live timing and scoring will be available Thursday and Friday on arcaracing.com. Picture: Praytor and the Realtor car making their way through the Ss to the front stretch at New Jersey Motorsports Park during the Barbera Autoland 150. CAR: Hixson Motorsports chassis #5, nickname �Pooh� as in Winnie the Pooh. Pooh is the team�s short track work horse with a 10th place finish at Elko and Praytor�s career best finish of 9th at Winchester Speedway. The Moose drove Pooh to a 16th place finish at Road America in his only other road course outing. Practice for the Barbera�s Autoland 150 presented by Driven Racing Oil is Saturday, July 27 from 11:20 a.m. � 12:50 p.m. with final practice afterwards from 1:40-2:40. Menards Pole Qualifying presented by Ansell follows final practice at 4:30. Sunday�s race is scheduled to roll off at 1. (All times EST) ARCAracing.com will feature live timing and scoring of all on-track activity as well as live flag-to-flag audio coverage of the race. The ARCA race is just part of a jam-packed weekend of racing to include Porsche Club of America, U.S. Drift, and the SCCA�s Fidelity Power Systems Pro IT. 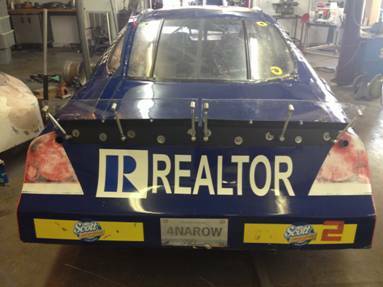 Picture: Special clear lexan spoiler for the road course Realtor car. Chassis #3, �Mickey Mouse�, (left) is in the paint booth and will be the backup car for New Jersey and the primary car for Berlin and the dirt tracks, Duquoin and Springfield. Chassis #7 �Scooby Doo� (center) is out of the Soddy Daisy paint booth and is in Mobile for final prep before being ready to go to the track. Chassis #5 �Pooh� the team�s short track work horse, had a new motor installed in the Soddy Daisy shop and the setup has been changed over to a road course setup with a special road course transmission for the road course in New Jersey this weekend. Next up for the Hixson Motorsports/Max Force Racing team is the Barbera�s Autoland 150 presented by Driven Racing Oil on the road course at New Jersey Motorsports Park, Sunday July 28th. Weeks of fine tuning and primping the Realtor Ford Fusion paid dividends from the first lap of practice for the Ansell ActiveArmr 150 Chicagoland Speedway. But for the first time since Talladega Thomas �Moose� Praytor would not see the checkered flag recording a 23rd palce finish. As the weekend progressed Praytor�s qualifying time would be over a second faster than his best practice time putting him in the 14th position, then things started to go bad. After the command to start engines instead of taking the parade laps Praytor drove his Realtor Ford directly to the pit box and the team raised the front of the car to ensure the right front didn�t rub then swapped the right side tires putting the tire that had rubbed to the rear of the car. A long sideways spin down the back stretch killed all 4 tires and Praytor was back on pit road for some fresh rubber. Back under green the Moose was rumbling again and it didn�t take long before he worked his way back up to the 40 of Casola. The damage from the spin was too much for the team to fix and what should have been a good day was over early. Fortunately the early exit did not cost Praytor a position in the Championship standings and he leaves Chicagoland in the 8th position. 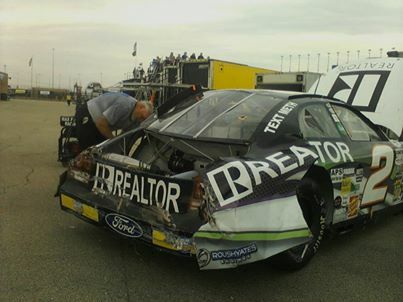 Picture: Owner Wayne Hixson surveys the damage on the Realtor Ford Fusion at Chicagoland Speedway. 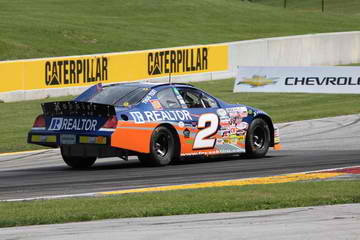 As a 3rd generation Realtor driving the Realtor car at the home of the National Association of Realtors in Chicago, Thomas �Moose� Praytor and his Hixson Motorsports/Max Force team have been working overtime to take their best piece to the Ansell ActiveArmr 150 at Chicagoland Speedway this weekend. If you�re driving a Ford, the Ford horses live at Roush Yates Performance in Mooresville, North Carolina where Praytor has been entrenched in the engine shop since Sunday. After installing a fresh Roush Yates power plant, �Batman� (Nickname for chassis) took a test flight on the Chassis Dyno and the motor team has declared the Cape Crusader ready for action. 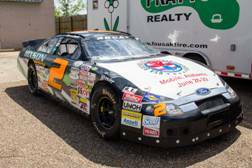 Praytor will pilot Ford Chassis RK 275 nicknamed �Batman� this weekend. Batman has become the team�s workhorse Speedway chassis and is coming off a 10th place finish in it�s last outing at Michigan International Speedway. Practice for the Ansel ActiveArmr at Chicagoland Speedway is slated for Saturday, July 20th with live timing and scoring coverage on arcaracing.com. The race is part of a double header Sunday with the NASCAR Nationwide Series and will broadcast live on Speed at 5:00 PM CST. Picture: Thomas �Moose� Praytor and Evan Cupples of Roush Yates Performance making adjustments to the Realtor Ford Fusion for the Ansell ActivArmr 150 at Chicagoland Speedway. 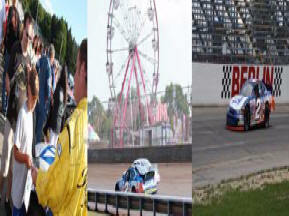 NBC Sports Network will air four ARCA Racing Series presented by Menards races in the second half of the 2013 Season. The addition of NBC Sports broadcast to SPEED�s remaining 5 broadcast puts 9 of the final 12 races of the season on national television. NBC Sports will broadcast some classic short tracks, Winchester, Berlin and Madison along with the 1 mile dirt oval at the Illinois State Fairgrounds. "We look forward to presenting the excitement of the ARCA Racing Series to motorsports fans on NBC Sports Network for the first time," said Mike Perman, Vice President, Programming, NBC Sports Group. Veteran ARCA commentators Rick Allen and Jim Tretow have been tapped by NBC Sports to anchor the broadcast. NBC Sports Network is part of the NBC Sports Group. Now in more than 80 million homes, the Emmy-award winning network is the cable television home of the Summer and Winter Olympics, National Hockey League (NHL), Major League Soccer (MLS), IZOD IndyCar Series, Tour de France, the 34th America's Cup, Premier League and Formula One. In addition, NBC Sports Network features college football, college basketball, college hockey, cycling, outdoor programming, horse racing surrounding the Triple Crown and Breeders' Cup, Fight Night boxing, Ironman, the Dew Action Sports Tour and USA Sevens Rugby. The network is also home to original programs such as Costas Tonight, The Crossover, NFL Turning Point, Pro Football Talk and The Dan Patrick Show. NBC Sports Network is distributed via cable systems and satellite operators throughout the United States. The Herr�s Chase for the Taste 200 at Winchester Speedway was billed as an old fashioned short track throw down that turned into a no holds barred donnybrook! For Scott�s Rookie of the Year candidate Thomas �Moose� Praytor Winchester would be another learning experience that would end with a career best finish of 9th on one of the toughest short tracks in the country. Better is a term being used a lot in the ARCA garage when it comes to the Hixson Motorsports/Max Force Racing Realtor Team. For the 4th consecutive week Praytor was faster in the race than he was in practice and qualifying. The team has recorded its 3rd top 10 in the last 5 races and has moved up to the 8th position in the ARCA Series presented by Menards Championship standings and has closed the gap on 7th and 6th. After 7 straight weeks of racing the Praytor and his team get a valuable couple of weeks off to prepare for the second half of the 2013 season. Next up for the ARCA Series presented by Menards, the Ansell ActivArmr 150 at Chicagoland Speedway on July 21st. 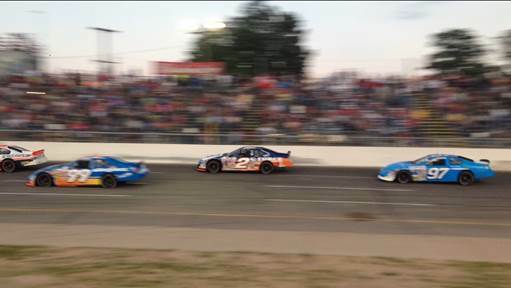 Picture: The Bull (Brennan Poole) and the Moose (Thomas Praytor) battling for position during the Herr�s Chase the Taste 200 at Winchester Speedway. Photo compliments of ARCA Racing. Coming off the pounding lefts and rights of Road America, ARCA driver Thomas �Moose� Praytor took in the first day of action of the USA Boxing Junior Olympic Championship at Mobile�s Arthur Outlaw Convention Center before heading to the high banks of Winchester Speedway in Indiana. �It�s incredible to watch these young guys go at it working their way to the top. They beat on each other for 3 rounds and then high 5 each other when they get done, the sportsmanship is incredible,� offered Praytor. 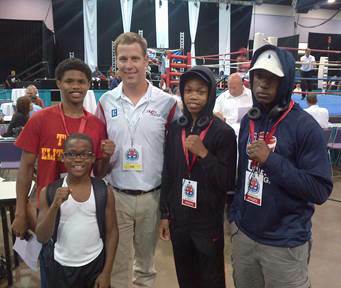 �All of these guys are chasing a dream and you never know, we could be looking at a future gold medalists or the next champion of the world.� The Junior Olympic Boxing Championship continues through Saturday and tickets are available at the Convention Center. While the gloves will be on in Mobile this weekend, the gloves will be off for the Moose and his Realtor Chevy in an old fashion short track throw down in the Herr�s Chase the Taste 200 at Winchester Speedway. Practice and qualifying are scheduled for Saturday June 29th with the Herrs Chase the Taste 200 rolling off Sunday June 30th at 2:00 EST. The Herrs Chase the Taste 200 is the main event of a triple header weekend at Winchester Speedway with the ARCA Trucks and the ARCA CRA Series racing on Saturday. The Herr�s Chase the Taste 200 will be broadcast live on www.arcaracing.com radio with live timing and scoring all weekend on www.arcaracing.com. NBC will broadcast the race tape delayed on NBC Sports Network. The 4 mile Road America road course in Elkhart Lake Wisconsin is considered a road racers paradise but for a Rookie driver that has never seen a road course in a field filled with NASCAR road race aces Dante�s Inferno would be a better description with the 14 turns replacing the 9 circles. Scotts Rookie of the Year candidate Thomas �Moose� Praytor made his first road course laps this weekend in the SCOTT 160 turning the most practice laps of all drivers with only one off road excursion. �Everything about the road course is so completely different. I heard Max Pappis say it was like having a football player play in a NFL game on Sunday and the next week have him play in a MLB game and that�s the way I felt. Last week we were going 200 MPH, not using any brakes and making a slight left hand turn and this week I was braking turning right and left then shifting and doing it all over again, 560 times!� said Praytor. �We knew this week was not going to be a spectacular week but we had to have a solid effort to keep up in the points battle and our Realtor team accomplished what we needed and even moved up a spot.� Praytor qualified 18th finished 16th and moved up to 8th in the ARCA Series Championship standings. After taking out the half dozen NASCAR Nationwide and road race aces in for the weekend Praytor finished a respectable 10th among ARCA Series regulars. Next up-back to the short tracks for the Herr�s Chase the Taste 200 at the half mile high banked Winchester Speedway in Indiana. 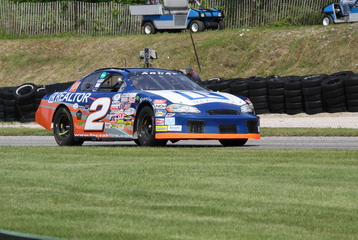 Having never turned a road course lap Thomas "Moose" Praytor knew he would have to put his Realtor machine through its paces in practice at Road America for Saturdays SCOTT 160 and the 3rd generation Realtor led all competitors in laps made during practice at Elkhart Lake. "Really learned a lot today. Kept our Realtor Chevy on track most of the day except for a little mishap in turn 14 that landed me in the kitty litter", offered Praytor. ARCA veteran, Mark Gibson, with over 250 starts, came by and reminded the Scotts Rookie of the Year candidate he wasn't at Gulf Shores and to stay off the beach! "The road course is completely different than anything else I've done, we ran 20 laps today and I was drained physically and mentally. Can't wait for tomorrow's Scott 160." 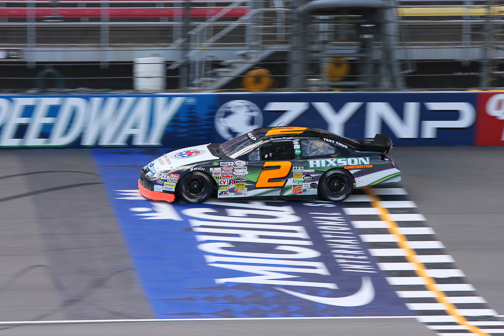 Menards Pole Qualifying presented by Ansell is scheduled for 9:05 a.m. Saturday. While qualifying is typically done with one car on the track at a time, qualifying on a road course is different. Cars will be split into groups based on practice speeds, then will go out onto the track in those groups for 10 minute sessions. Qualifying will then be based on fastest lap times during those 10 minute sessions. The SCOTT 160 is scheduled to start around 12:45 p.m. Saturday, Central Time. 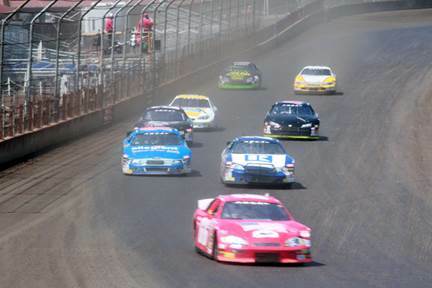 For live timing and scoring as well as streaming audio for the ninth race of the 2013 ARCA Racing Series presented by Menards season, log on to http://www.arcaracing.com/. SCOTT 160 ROAD AMERICA: As if the string of new tracks wasn�t enough for the Scott Rookie of the Year Candidate, this week the ARCA Series presented by Menards mixes in some right turns with the lefts over 4 miles of road course in the Scott 160 at Road America in Elkhart Lake, Wisconsin. �Each week is a new challenge and its part of what has made this season so special. I haven�t been on a road course since the Outdoor Channel Bandolero at Atlanta Motor Speedway 10 years ago. This weekend is going to be interesting,� offered Thomas �Moose� Praytor. Praytor carries big momentum into the Scott 160 having finished in the top 10 2 out ofn the last 3 races. CAR: Hixson Motorsports chassis #5, nickname �Pooh� as in Winnie the Pooh. The team has converted this short track chassis for road course use this weekend at Road America. The last outing for this chassis was the Akona 250 in Elko Minnesota where Praytor recorded his first ARCA top 10 finish. Practice is scheduled for Friday June 21st with qualifying and the Scott 160 scheduled for Saturday June 22nd at 12:45 PM CST. The Scott 160 is part of a double header slate of racing with the NASCAR Nationwide Series racing after the ARCA race. The Scott 160 will be broadcast live on www.arcaracing.com radio with live timing and scoring all weekend on www.arcaracing.com. HIXSON MOTORSPORTS/MAX FORCE RACING: Max Force Racing is based out of Mobile, Alabama and is fielding cars in its 16th season of competition. Max Force has teamed with another home grown operation, Hixson Motorsports with 3 decades of experience in the ARCA Series from Soddy Daisy Tennessee for the 2013 season. THOMAS �MOOSE� PRAYTOR: In 2012, Moose made his first ARCA start in the inaugural ARCA-Mobile 200 at Mobile International Speedway. He also raced in the International Motorsports Hall of Fame 250 at Talladega with Andy Belmont Racing and rounded out the season with a couple of starts for Venturini Motorsports. Praytor is currently 9th in the ARCA Series Championship point�s standings. Prior to the ARCA series, The Moose started cutting his racing teeth at 8 years old on short tracks across the Southeast, racking up local and state titles along the way. The Moose and his Max Force Racing Team earned the Ironman Status of the Gulf Coast in 2011 for competing in every Late Model (Pro & Super) Race at Mobile International Speedway and Five Flags Speedway, finishing in the top 10 in the Championship standings at both tracks. Away from the track Praytor was one of AJ McCarron�s centers through grade school and high school winning a state title in 2007. Recently the duo teamed up donating a specially prepared McCarron replica racing helmet that Praytor wore at Daytona and Talladega to the Alabama Institute of Deaf & Blind for their annual Race Fever auction. For more on the Moose- www.realtorcar.com. Praytor racing for the 10th spot with Venturini Motorsports Milks Duno. Overcoming tire issues Thomas �Moose� Praytor and his USA Boxing Junior Olympic Championship Ford counter punched up to a 10th place finish in the Patriot Pumps ARCA 200 at Michigan International Speedway. Praytor matched his career best ARCA finish of 10th for his second top 10 of the season maintaining the 9th position in the ARCA Championship points standings closing to within 25 points of 8th place. After tackling the �Tricky Triangle� in Pocono with no practice, Praytor was happy for a clear forecast and a 2 and a half hour practice session at the blazing fast Michigan International Speedway for the Patriot Pumps ARCA 200. 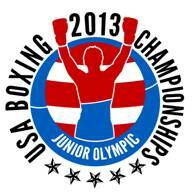 �We had a really solid USA Boxing Junior Olympic Championship Fusion off the hauler and worked on several different set up ideas on Thursday. It took a little while to get used to the speed you carry off into the corner and finding the right place to let off and get back on the gas. 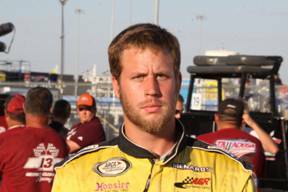 The ARCA veterans were really a big help on getting around,� said Praytor. After practicing as high as 14th , Praytor timed in the USA Boxing Junior Olympics Championship Ford in the 16th position. With the drop of the green flag the Moose was rumbling picking up spots on the racetrack. A caution at lap 26 brought the USA Boxing Junior Olympics Championship machine to pit road for fuel and a precautionary 4 tires, the 4 tire stop would be the move of the race. �On the first stop we found out the right front was showing the cords on the inside edge of the tire giving us a warning that there could be a problem with the right front on long runs.� 4 tires and a broken pit gun during the stop made for an extended stay on pit road putting Praytor at the end of the lead lap cars. Back under green the Moose was picking up spots in traffic while the leaders were setting a torrid pace up front in clean air. Praytor had worked his way up to the next in line for the free pass and the caution flew before he could complete the pass for the position. As the race played out the caution would trap Praytor off the lead lap but still racing with a big group of cars. With the early tire issue on the right front, the decision was made for Praytor to come to pit road at every opportunity to change 4 tires. �We worked the pit crew over today, the boss called for 4 tires and fuel on almost every caution, the guys did a great job and kept us in contention.� Taking 4 tires and fuel compared to other strategies almost always had Praytor off pit road last giving the Scott�s Rookie candidate lots of experience on passing cars at the 2 mile oval. In a classic tortoise and the hare race, the decision to keep fresh rubber on the USA Boxing Junior Olympics Championship Fusion gave Praytor an opportunity for a solid finish while some teams gamble on tire wear would cost them an opportunity at a good finish and a race car. A final restart gave Praytor an opportunity to slip by the 35 car and into the top 10. The fresh tire move would pay even bigger dividends for the Mobile, Alabama rookie when in the closing laps a piece of debris cut both left side tires and Praytor returned to pit road with 2 flat left side tires. Praytor maintains the 9th position in the ARCA Championship point�s standings and closed to with 25 points of the 8th position and 65 points of 7th. Racing every weekend continues next week with the Scotts 160 at the 4.2 mile road course at Road America in Elkhart Lake, Wisconsin. The USA Boxing Junior Olympic Championship Ford will roll off 16th for this afternoons Michigan ARCA 200. "Our USA Boxing Fusion has been solid since we unloaded of the hauler. We made a gear change yesterday and worked on getting the right front all the way on the ground. Everything the guys threw at it made us faster. Really looking forward to the green flag and 200 miles of racing," said Thomas "Moose" Praytor. Race will be broadcast live on SPEED at 4:00 CST with a re-air tonight at 9:00 PM CST. Live timing and scoring on arcaracing.com. LAST RACE-ARCA POCONO 200: The �Tricky Triangle� at Pocono Raceway was extra tricky last week for the Scott�s Rookie of the year candidate. A broken oil line kept Praytor from making any practice laps, his first lap at the Speedway was the drop of the green flag. The repairs to the motor sent Praytor to the rear for the start and he was able to bob and weave his way up to 16th. PREVIOUS ALABAMA WINNER: Alabama�s Dave Mader, III won the ARCA 200 at Michigan International Speedway on June 22, 1991. Mader was inducted in to the Alabama Motorsports Hall of Fame in Talladega earlier this year and is part of Praytor�s Mobile connection. Mader helped put together the Daytona car and test it at Daytona International Speedway. CAR: Hixson Motorsports chassis RK 275, nickname �Batman� is a former Sprint Cup winning chassis at California & Texas with Greg Biffle behind the wheel. Praytor drove the same car last week at Pocono to a 16th place finish. Practice is scheduled for Thursday June 13th with qualifying and the Michigan ARCA 200 scheduled for Friday June 14th at 4:00 PM CST. 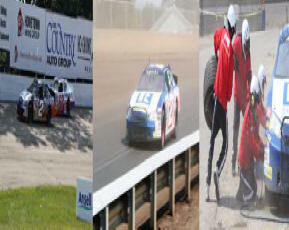 The Michigan ARCA 200 will be broadcast live on SPEED with live timing and scoring all weekend on www.arcaracing.com. SPEED will re-air the broadcast at 9:00 CST. 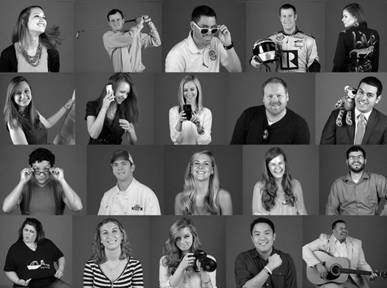 The Press-Register/AL.com announced their first class of 20/20 Vision members that were selected through nominees from the public. The inaugural 20/20 class includes business owners, teachers, artists and entertainers of all ilk, community leaders, a chef, an engineer and even a racecar driver, Thomas �Moose� Praytor. � Why he lives in Coastal Alabama: "There's so much to do here, I never really felt like I needed to go anywhere else. When you go to other places, you appreciate what you have here." � Claim to fame: NASCAR driver in the ARCA Racing Series. � Next step: Become a full-time, professional racer in the NASCAR Sprint Cup series, and take over the family business. A name like Praytor is easy to recognize in Mobile, especially in the housing industry. But these days, the Praytor gaining attention isn't Jamie Praytor, the company's late founder; it's her 23-year-old grandson. Thomas Praytor has worked as the property manager for the past three years at Praytor Realty Co. Inc., a mid-sized, family-owned company, but that's just his day job. He's built a name for himself outside the housing business with stock car racing, competing for the past two years in the ARCA Racing Series. 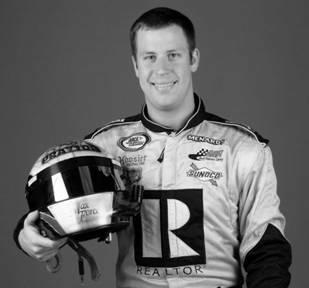 Racing since he was 8, Praytor moved up quickly through the local ranks and first raced at Mobile International Speedway at 16. He's picked up a number of titles throughout the southeast over the years, with more than 50 wins, a track championship, a state crown and three U.S. Army Rookie of the Year titles at two different tracks. As with the family company, Praytor says staying local is by far the most important thing in his quest for racing glory. "Everything we do, we try to stay in Mobile," he said. "I prepare the cars to race in our shop here, and three-fourths of our sponsors are local businesses. I feel like there's value in that." Though his ultimate goal is to get to the top in NASCAR, Praytor also hopes to take over the family business one day, but he "hasn't gotten that far," in figuring out how he'll balance the two dreams. "If the whole racing thing doesn't work out, then I'm already a distinguished realtor to where I don't have to start my life all over," he said. "But I'll do whatever it takes to get there." Pocono Raceway is one of the most difficult tracks in all of motorsports and eats first time Rookies for breakfast, lunch and dinner. 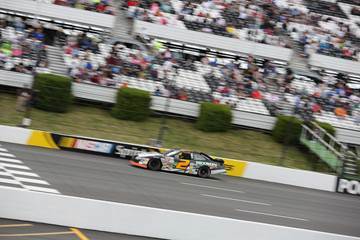 Thomas �Moose� Praytor was coming off a career best finish at Elko Speedway but had never seen the �Tricky Triangle� until Friday when rained covered the track and washed out all of the practice and qualifying for the ARCA race on Saturday. During a short practice session on Saturday an oil line issue kept the ARCA rookie from making any laps. �Rain on Friday was bad, the oil line going bad warming up was really bad, not being able to get it fixed in time to make the inspection line was even worse for our USA Boxing Junior Olympic Ford. Really have to thank the guys at Roush Yates for helping us out and our guys never gave up,� offered Praytor. Praytor and his Hixson Motorsports/Max Force team�s USA Boxing Junior Olympic Championship Ford are slated for 10 rounds next week at Michigan International Speedway. Live coverage from SPEED and timing and scoring on arcaracing.com. 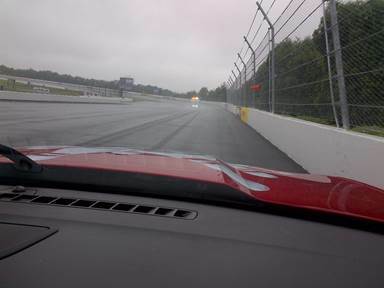 Heavy rains washed out all on track activity today for the ARCA Pocono 200. The schedule call for a short 30 minute practice session in the morning before going live on SPEED at Noon CST. "We really needed some laps today on our USA Boxing Ford at one of the hardest tracks on the tour. Mother Nature didn't cooperate and since I've never turned a lap here I sure would like a a lap or 2 before we start racing," offered the Moose. Practice timing and scoring is live arcaracing.com and the race will be live on SPEED. CAR: Hixson Motorsports chassis RK 275, nickname �Batman� is a former Sprint Cup winning chassis at California & Texas with Greg Biffle behind the wheel. CREW IN VICTORY LANE: While Pocono is new to the driver, members of the team have been to the �Tricky Triangle� on numerous occasions and even to Victory Lane. Tire specialist, Crystal Bates, went to Victory Lane last year working for Venturini Motorsports when Brennan Poole won the Pocono ARCAQ 200. Practice and qualifying are scheduled for Friday June 7th with the Pocono 200 slated for Saturday, June 8th at NOON CST. Live coverage on SPEED with live timing and scoring all weekend on www.arcaracing.com. 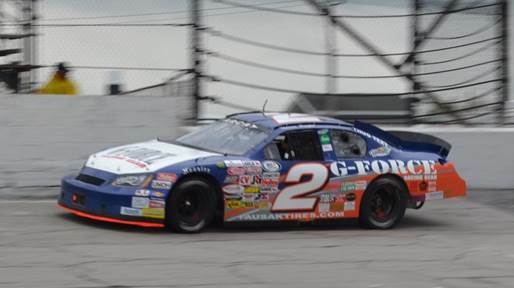 Thomas "Moose" Praytor wheeled the Realtor car to a career best 10th place finish in the ARCA Series Akona 250 presented by Federated Auto Parts at Elko Speedway, moving up to 9th in the ARCA Championship standings. 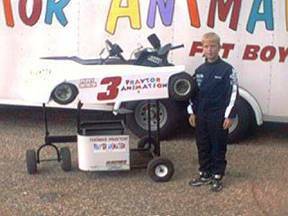 As rookie in a series that has been around over 60 years there are a lot of first and the trip to Elko Minnesota was another first for Praytor and his Hixson Motorsports/Max Force Racing Team. Elko Speedway can best be described as a classic 3/8ths mile bull ring just south of Minneapolis. "You're always working in the car, just about the time you get off the corner it's time to get set up for the entry of the next. There's not a lot of banking and if you don't get the car slowed down it'll never turn. All lessons the track taught me in my first few laps," offered Praytor. In preparation for the Akona 250 presented by Federated Auto Part the track had 2, 45 minute practice sessions planned. The first went off as scheduled and the second was washed out by rain. "We really needed that last practice session. We made a lot of changes to our Realtor car in the break and we needed to try them out. Even without the 2nd practice the guys made some great changes and we picked up nearly a second in qualifying." Praytor timed in at 13th the best of his ARCA career. With the drop of the green flag Praytor found himself in the middle of wild scramble for position. "Everyone was digging early and we stayed 2 wide most of the first 50 laps. It had to he a great show for the fans!" Praytor held his own in the first half of the race with the Realtor Chevy running 3 tenths of a second faster lap times than his qualifying effort. While everyone was scrambling for position the Realtor Chevy was getting tighter (car would not turn) with every lap. Just past the halfway point Praytor picked up the free pass as the first car a lap down and dove to pit road for a round of adjustments to free up the Realtor machine and the Moose was loose. "After we came to pit road our Realtor car came back to life and we were on the move." With the next caution Praytor came to pit road for 2 tires and fuel, saving 4 fresh Hoosiers for the final dash to the checkered flag. As luck would have it the race took on a long green flag run to the end and the 4 fresh Hoosiers would never see action. Even without tires Praytor would record his first top 10 finish marking a career best. "Really a good weekend for our Realtor team, we kept fighting all race long. Our crew did a great job all day and kept us in the hunt with our pit stops and adjustments. This was our second race with "Pooh" (as in Winnie the Pooh, nickname for Hixson chassis #5) and we really learned a lot on what makes Pooh handle. Congratulations to Frank Kimmel, the old man keeps showing us young guys how to get it done." Praytor moves up to 9th in the ARCA Championship standings while continuing to look for sponsorship to complete the season. In a year of first, Thomas �Moose� Praytor is looking at another first this weekend as he and the Realtor car make their first trip to Elko Speedway in Minnesota. 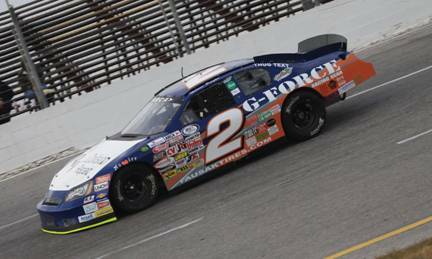 An 18th place finish at the Menards 200 presented by Federated Car Care at Toledo Speedway solidified Praytor�s position in the top 10 in the Championship standings an inched the Mobile, Alabama rookie a little closer to next spot up the line. �Our Realtor Car team was solid in Toledo, we needed a good finish and we got it. Elko is another wild card track, it�s tight, unforgiving and there will always be traffic. It�s the kind of place I love but gives my car owner and my spotter nightmares,� offered Praytor. Practice, qualifying and the race are Saturday, June 1st with the race beginning at 8:00 PM CST. If you can�t be there in person the race will have live timing and scoring on www.arcaracing.com. HIXSON MOTORSPORTS/MAX FORCE RACING: Max Force Racing is based out of Mobile, Alabama and is fielding cars in its 16th season of competition. 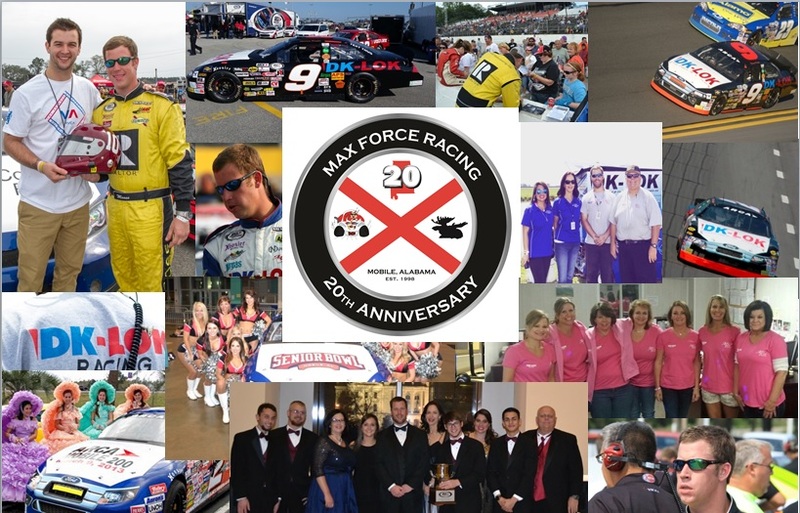 Max Force has teamed with another home grown operation, Hixson Motorsports, with 3 decades of experience in the ARCA Series from Soddy Daisy Tennessee for the 2013 season. Thomas �Moose� Praytor: In 2012, Moose made his first ARCA start in the inaugural ARCA-Mobile 200 at Mobile International Speedway. He also raced in the International Motorsports Hall of Fame 250 at Talladega with Andy Belmont Racing and rounded out the season with a couple of starts for Venturini Motorsports. Praytor is currently 10th in the ARCA Series Championship point�s standings. Prior to the ARCA series, The Moose started cutting his racing teeth at 8 years old on short tracks across the Southeast, racking up local and state titles along the way. The Moose and his Max Force Racing Team earned the Ironman Status of the Gulf Coast in 2011 for competing in every Late Model (Pro & Super) Race at Mobile International Speedway and Five Flags Speedway, finishing in the top 10 in the Championship standings at both tracks. Away from the track Praytor was one of AJ McCarron�s centers through grade school and high school winning a state title in 2007. Recently the duo teamed up to give a specially prepared McCarron replica racing helmet that Praytor wore at Daytona and Talladega to the Alabama Institute of Deaf & Blind for their annual Race Fever auction. For more on the Moose- www.realtorcar.com. The Moose with some old football teammates. AJ McCarron, the Moose and Hunt Griffith. Griffith traded in his football helmet for a glove and finished his career as a standout second baseman for the USA Jags. The other 2 are still looking for paying jobs. Thomas �Moose� Praytor rolled his Mobile Lumber Fusion off the trailer on Friday and within a few laps was thundering around his old stomping grounds of Mobile International Speedway. Halfway through a scheduled 4 hour test session the Moose unexpectedly shut the motor off in the middle of a 10 lap run. �There was just a little flutter in the motor and I knew it wasn�t good,� said the Moose. Back in the pits the crew inspected the motor and it didn�t take long to see the issue was terminal. Without a back up the Moose�s return to Mobile was over. �We had a really good car and just couldn�t believe we were done, all I can say that is printable is really bad.� Instead of spending the day preparing for the Southern Super Series 125 the team spent the day taking the motor out. �It was pretty bad day on Saturday, it�s like being a kid on Christmas morning to find out the Grinch stole your presents. 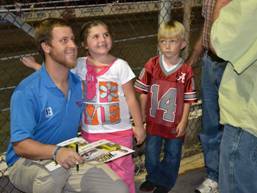 I�ve said all week the fans at Mobile are incredible and before the race I was in the grandstands signing autographs and talking with the fans. They were definitely what the doctor ordered. 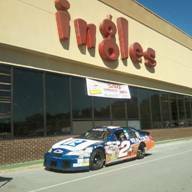 Congratulations to our old buddy Augie Grill on taking home the win.� The team is back in the shop today working on an ARCA car that will be announced later this week. �In the middle of a great racing weekend we want to remember of all of our troops on this Memorial Day weekend.� For the Moose he�ll be back in action this Saturday night in the Akona 250 at Elko Speedway in Minnesota. Live timing and scoring for the Akona 250 is on www.arcaracing.com radio broadcast in partnership with CBS Radio Minneapolis also on wwww.arcaracing.com. 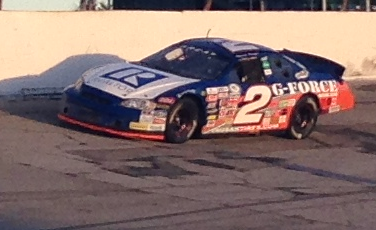 Praytor at Mobile International Speedway for the ARCA-Mobile 200. 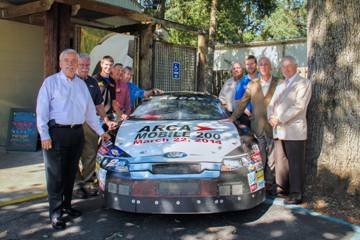 Photo courtesy of Ashley Rowe the official photographer of the ARCA-Mobile 200. Currently 10th in the ARCA Series presented by Menards Championship points standings and having the weekend off, Thomas �Moose� Praytor will return to his home track, Mobile International Speedway, to compete in the inaugural Southern Super Series 125 on Saturday night. After spending the first half of 2013 season bouncing from Daytona-Mobile-Salem-Talladega and having just returned from a 1,400 mile hauler drive to Toledo, Praytor is looking forward to being back at Mobile International Speedway. �Traveling with the ARCA Series has been awesome, I�ve learned so much from the other ARCA competitors. Almost everywhere we�ve been I�ve been a stone cold Rookie not this weekend,� offered Praytor. The Miller Lite 125 presented by VDL Fuel Systems on Saturday night is part of a Southern Super Series Gulf Coast Double header weekend with Pensacola 5 Flags Speedway getting the party started on Friday night with round one of their Blizzard Series. The Southern Super Series consist of 16 Super Late Model races contested at 5 different venues, Nashville�s Fairground Speedway, Gresham Motorsports Park, Montgomery Motor Speedway, Pensacola�s 5 Flags Speedway and Mobile International Speedway. The Series culminates with running of the All American 400 at Nashville�s Fairground Speedway in November.